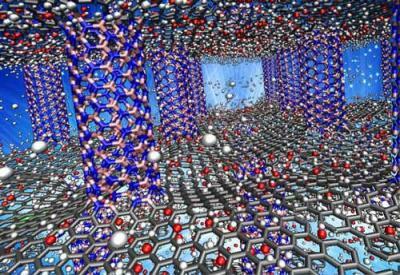 Researchers at Rice University have found that layers of graphene, separated by nanotube pillars of boron nitride, may be a suitable material to store hydrogen fuel in cars. The boron nitride pillars are situated between graphene layers to make space for hydrogen atoms, similarly to spaces between floors in a building. The actual challenge is to make the atoms enter and stay in sufficient numbers and exit upon demand. The team focused the simulations on four variants: pillared structures of boron nitride or pillared boron nitride graphene doped with either oxygen or lithium. At room temperature and in ambient pressure, oxygen-doped boron nitride graphene proved the best, holding 11.6% of its weight in hydrogen (its gravimetric capacity) and about 60 grams per liter (its volumetric capacity); it easily beat competing technologies like porous boron nitride, metal oxide frameworks and carbon nanotubes. At a freezing -321 degrees Fahrenheit, the material held 14.77% of its weight in hydrogen. The researchers added that the polarized nature of the boron nitride where it bonds with the graphene and the electron mobility of the graphene itself make the material highly tunable for applications. "What we're looking for is the sweet spot," they said, describing the ideal conditions as a balance between the material's surface area and weight, as well as the operating temperatures and pressures. "This is only practical through computational modeling, because we can test a lot of variations very quickly. It would take experimentalists months to do what takes us only days."